Dave Gates' (BH-8875) earliest Star Wars memory takes him back to when he was a kid, sitting in a local theater with his brother as that massive Star Destroyer cut across the screen while watching Star Wars. The film had a lasting impact on young Dave as later in life he would build his own Boba Fett costume and would eventually lead him to join the 501st Legion. "While building my Boba Fett costume, I heard about the 501st Legion from other Boba Fetts of The Dented Helmet, an online discussion forum and information archive to help fans build high quality replica Fett costumes," says Dave. He finished his Boba just in time for the fall 2005 Motor City Comic Con and it was here that he met members of what was then the Michigan Squad. "Their costumes were great and everyone was super nice. I had thought about joining the 501st Legion while building my suit, but was not really sure if it was for me. Well, once I met the group at MCCC, saw the display table (small by today's standards), and had experienced costuming, I was hooked." He sent in his application and trooped his first official event a few weeks later. Since then, Dave has trooped almost 100 events! When asked if he has a favorite, he replies, "it's really hard to say. Big or small, high profile or low, charity or promotion, convention or formal, each one holds a great memory for me, just for what it was. "The 501st Legion has changed my life. I went from being a casual observer of the Star Wars universe to an active participant." Dave no longer watched, collected or played with Boba Fett; he WAS Boba Fett! With that new level of fandom came some very cool and unexpected opportunities. 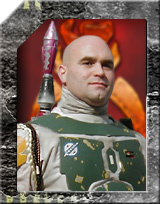 Dave can be found on the Great Lakes Garrison forum as Gator Fett. When asked about the origin of his nickname, Dave says, "Gator is a nickname derived from my last name. Gates ... Gateser ... Gator. Get it?" His dad was Gator to his friends, and his grandfather was too. "I was never called a Gator until my sophomore year in high school, when one of the seniors on the swim team made the connection and started calling me Gator," says Dave. He added the "Fett" when he needed a board name on The Dented Helmet and Gator was taken by someone in Florida. When Dave is not collecting bounties on rebel scum, he works for Chrysler at the Tech Center in Auburn Hills. He has not had a chance suit up recently as he was promoted this past April to a new position as a Facilities Engineering Manager in the Advanced Manufacturing Powertrain Division. Dave has three daughters and they keep him and his wife pretty busy and occupied with all the hobbies they are getting into these days, but he still finds time to enjoy SCUBA diving, home improvements, and he has started on a few costuming projects not related to Star Wars. Other accomplishments outside of the 501st that Dave is most proud of are his family, career, obtaining an MBA and being a registered Professional Engineer.